Let's say luminol is applied to a floor and barefoot prints show up, and are defined enough to make comparisons to known foot impressions. 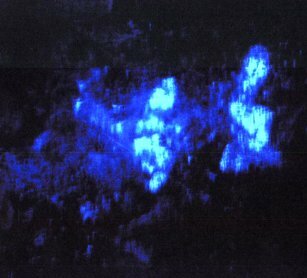 My question is- if luminol detects blood that has been cleaned up, why isn't the result a smear pattern? 4 = 5 'proof' ... what's wrong? is everybody crazy but me and a few? Here is an example of a print that showed up when it is used and the area wasn't scrubbed. Now when the area is scrubbed it would look like this. So scrubbing the area does smear the are where the blood is.